Still going through June 30th! You still have of June left to participate in the All Iowa Shop Hop. Ninety-one Iowa quilts shops are participating in this annual shopping extravaganza with store specials, special patterns, give-aways, prizes and more. This year’s theme is Postmarked Iowa. Shop hoppers should pick up a copy of Sew Iowa Magazine from their favorite quilt shop to find their passports, a list of all of the stops, and where they can get their custom Postmarked Iowa fabric. Visit five or more participating stores and turn in your completed passport and you can be eligible for the prize drawings. Find out more at the AISH website or Facebook page. Adel Quilting & Dry Goods Co. will host their annual Little Sisters Outdoor Quilt Show Saturday, June 16th, from 10:00 am to 4:00 pm. Their shop is located at 909 Prairie St in Adel. This event also includes a special exhibit of quilts made by Quilt Circle of Friends members featuring Barn Quilt Sign blocks. 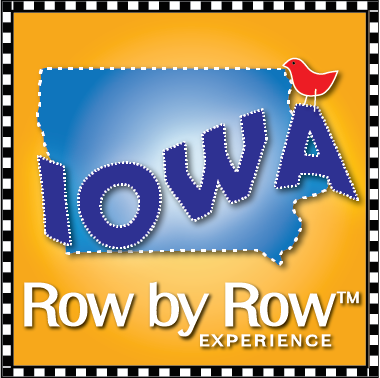 Sixty Iowa Quilt shops are also participating in this year’s Row by Row Experience. The theme for 2018 is Sew Musical. Visit any participating quilt shop between June 21st and September 4th and ask for the pattern for a row in the Row by Row, Sew Musical quilt. There is no charge for the patterns during this time period. Complete a quilt using at least 8 different rows from 8 different 2018 participating shops and be the first to bring it into a shop to win a stash of 25 fat quarters. Win a bonus prize for using that store’s row in your quilt. A quilt will be considered “complete” when it is quilted, bound, and labeled. Use any pattern to layout your rows! You decide. Stack your rows, arrange around a center medallion, make them horizontal, vertical, upside down, on the front, on the back, whatever! You are the designer. Be creative and have fun, but be sure to use at least 8 different 2018 rows. As you visit the participating shops, you can collect the commemorative license plates as well. Victoria Findlay Wolfe’s first retrospective exhibit, Playing with Purpose, is on display at the Iowa Quilt Museum through July 29th. Victoria entered the modern quilt world when making quilts for her three-year-old daughter. Now she is known for creating unique one-of-a-kind quilts of her own design and sells her original works to collectors, architects and decorators while also available to work on commissioned projects. She has also published three books and lectures and teaches globally. In late June, Victoria will be in Iowa teaching for the Des Moines Area Quilt Guild and at Piece Works Quilt Shop in Winterset. 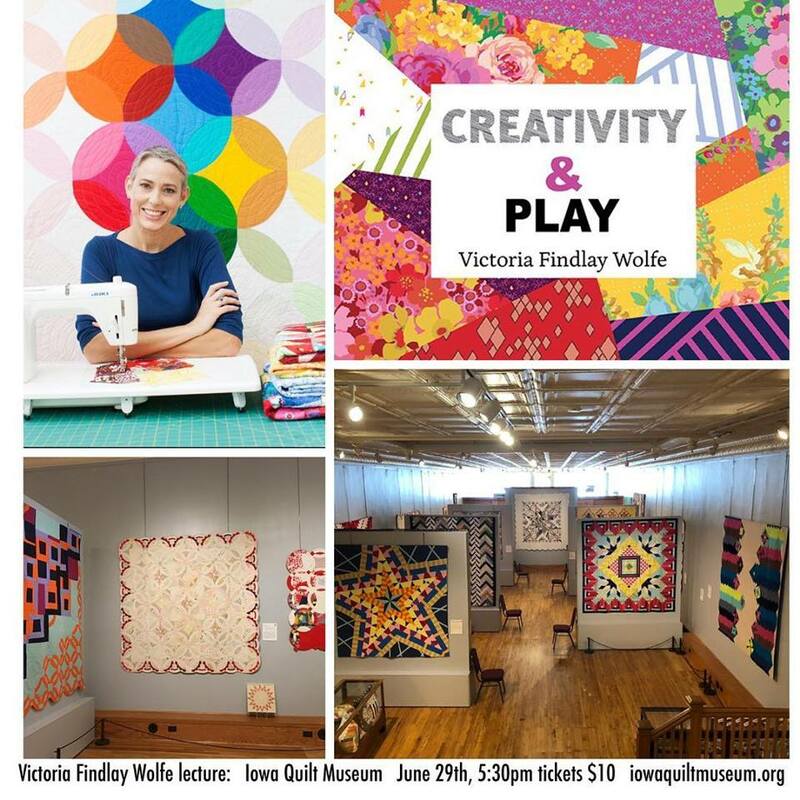 And on June 29th at 5:30 pm, she will give a lecture at the Iowa Quilt Museum on Creativity & Play; about her quilts, her stories and her passion for quilting. Tickets are $10 and seating is limited so purchasing them ahead of time is highly recommended. 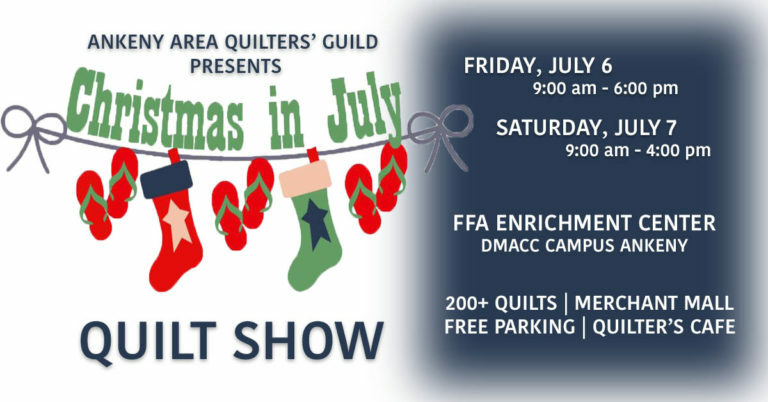 The Ankeny Area Quilters’ Guild will present their annual show, Christmas in July, on Friday, July 6th, from 9:00 am to 6:00 pm, and Saturday, July 7th, from 9:00 am to 4:00 pm. 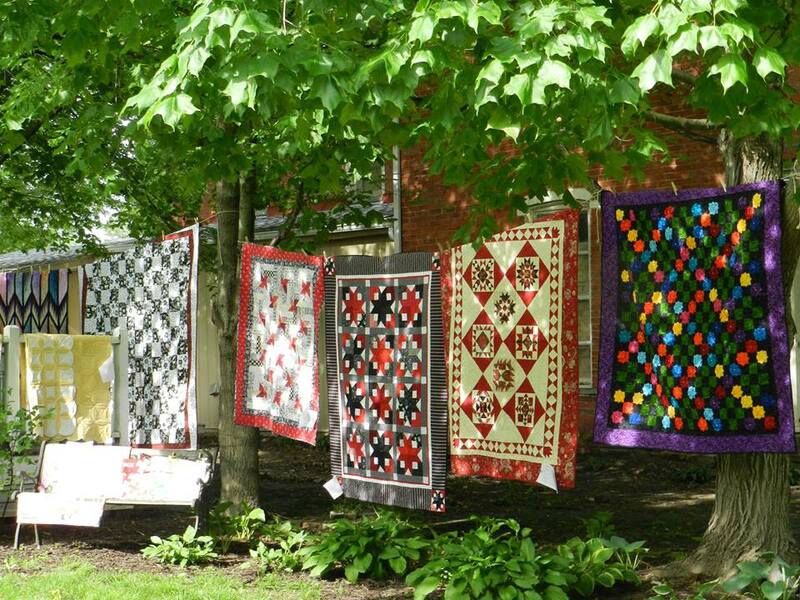 Visitors can see over 200 beautiful quilts crafted by members of the guild, enjoy a bed turning with stories about how the quilts came to be, visit vendors, learn at free demonstrations and instructor-led classes and enjoy a tasty lunch in the cafe. The show is held in the FFA Enrichment Center on the DMACC Campus in Ankeny at 2006 S. Ankeny Blvd. If you’ve never been to the International Quilt Study Center and Museum in Lincoln, Nebraska, it’s time to remedy that! And if you haven’t been for a while, then surely you’re ready for a return trip. Join IQM director, Megan Barrett, on a motorcoach trip to Lincoln on Friday, July 27th. While at the IQSCM, we’ll see the following exhibits: War & Pieced (The Annette Gero Collection of Quilts from Military Fabrics), Singular Fascination, Molly Anderson: Intricate Embellishments, Crazy Quilts, Color & Contour: Provencal Quilts & Domestic Objects, and Marti Michelle & the Business of Quilts. We’ll have a guided tour through some of the exhibits and others will be self-explored. The tour will also include a behind-the-scenes tour of the storage and preservation rooms of the IQSCM. A delegation from the IQM got to see this in March and it is fascinating! No tour of quilts would be complete without some shopping and on this trip we’ll be visiting the Cosmic Cow in Lincoln and another shop along the way (TBD). The price of the tour is $94 per person and includes: comfortable motorcoach transportation, admission to the IQSCM plus a behind-the-scenes tour, lunch, trips to two quilt shops (sorry, no allowance provided!) and quality time spent in the company of like-minded quilters! 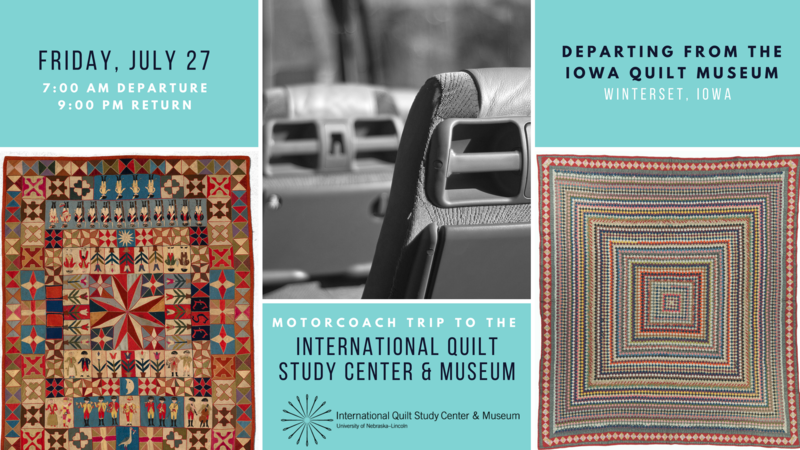 The tour will depart from the Iowa Quilt Museum at 7:00 am and return at approximately 9:00 pm. The IQM will be open at 6:30 am for those early birds who would like to view the exhibit (the last few days of Victoria Findlay Wolfe’s Playing with Purpose) before departure, and will re-open for 30 minutes upon our return for the night owls. A minimum of 30 travelers are needed (by July 13th) for the trip to be viable. Follow this link to sign up!